Ready for the New Names Showdown 2018 winners? From those sixteen names, we voted all the way down to two finalists each: Florence or Marlowe for girls, and Wells or Caspian for boys. The purpose of the New Names Showdown is to choose the name most likely to rise in the rankings in the coming years. We don’t know, of course, but we’ve made some pretty good guesses over the last two years, especially on the boys’ side. 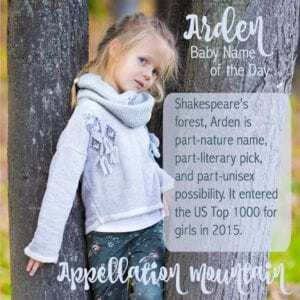 In 2016, the first-ever winner of the New Names Showdown was Arden. Slightly literary, vaguely outdoorsy, and very much unisex in style, Arden seemed like a promising pick. Couldn’t you imagine hundreds of parents, crushed to learn that Harper was so very popular, moving on to Arden instead? It seemed possible, but alas – it was not to be. Instead, Arden faded. It entered the US Top 1000 at #915 in May of 2016. A year later, it fell to #972. And now? It’s out of the rankings entirely. Still, don’t count this name out. It’s tailored, tied to the natural and literary worlds, and still feels rich with promise for a daughter. Read more about Arden here. A year later, Sylvie too the top spot. Sylvie had long been a darling of the baby naming community, featuring on lots of lists. And why not? A worthy successor to Ava and Ivy and Avery, too, with something of Sophie’s charm, too, Sylvie seemed like a name destined for the heights of the chart. 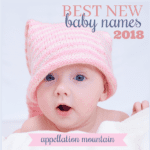 And yet … we voted Sylvie the winner of the New Names Showdown in 2017. The name had debuted in the US Top 1000 at #959. But this year, it fell, barely holding a place on the list at #993. As with Arden, I’m not ready to count this one out. Sylvie succeeds beautifully on sound, a name that should satisfy parents looking for an alternative to so many current favorites. Read more about Sylvie here. It was quite the dramatic contest. When I closed the polls, Florence and Marlowe were locked in tie, vote for vote. So I had to re-open voting and hope that the tie didn’t hold. Sure enough, Marlowe inched into the lead, ultimately defeating Florence with 51.1% of the vote. Marlowe entered the US Top 1000 at #981. It’s easy to imagine it following former favorites like Mackenzie and Madison right up to the top of the charts. But, of course, that was true for our past New Names Showdown winners, too, so only time will tell. Read more about Marlowe here. Our very first New Names Showdown winners was Wilder. And oh, boy golly, did we get it right! Wilder entered the US Top 1000 at #962, rose to #725 a year later, and now stands at #573. Parents are discovering it at a rapid pace, though I think it still feels novel … at least for now. It checks lots of boxes. 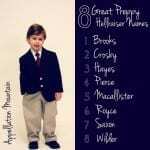 You can imagine parents who love preppy, surname-style names like Carter considering Wilder, too. It might appear to parents naming a brother for Maverick. Or maybe it’s an alternative to outdoorsy names, to River and Rowan and Kai. In any case, the New Names Showdown worked exactly like I imagined. The marvelous community of Appellation Mountain readers accurately guessed the next big thing. Read more about Wilder here. The next year, we picked Shepherd as the New Names Showdown winner, and once again, we seem to on to something. 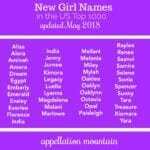 The name debuted at #862, and rose to #797 in the most recent data. 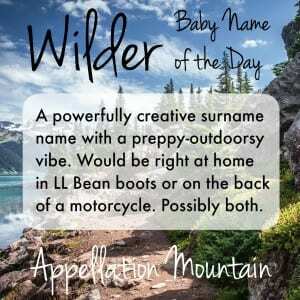 It’s a gentle and meaning-rich name, a little bit modern virtue, but also with a hint of the same buttoned-down style that Wilder shares. Read more about Shepherd here. This year’s final came down to two names with ties to the water: Caspian and Wells. Once again, the contest came down to just a handful of votes, but Wells pulled ahead, winning with 51% of the vote. Wells debuted at a respectable #915 this year. What makes it so appealing? Just like ends-with-n names gave way to ends-with-r choices, there’s an uptick in boys’ names ending with ‘s’. Besides James and Miles, lately we’re hearing more of Brooks and Ames and Briggs, and yes, Wells, too. 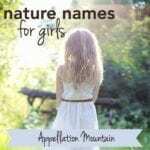 It’s a subtle nature name, and the idea of a well brings to mind good health, too. One more positive: a character from the early seasons of The CW’s smash-hit sci fi series The 100 answered to the name. Read more about Wells here. 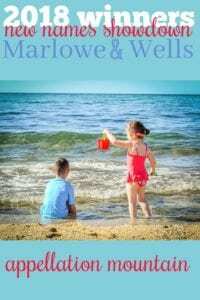 What do you think of Marlowe and Wells? Do you think they’ll catch on? 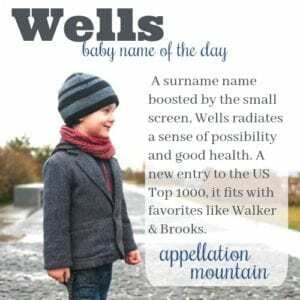 We named our May 2018 baby Wells. Our 2015 son is Ridge. I think Marlowe is more likely to keep climbing than the previous two winners. It slots into a few different trends at the same time: that hip ‘o’ sound, boy name for girls, and literary. It’s the edgier cousin of Margo. I see Wells doing well too. It fits the surname trend but seems warmer than the usual-er ending names. Caspian might be a hit for your readers but I think it will be perceived as too out there by the average parent.